Great fishing days at Bolgoda Lake with Japanese anglers : Yuzo san & Satoru san. 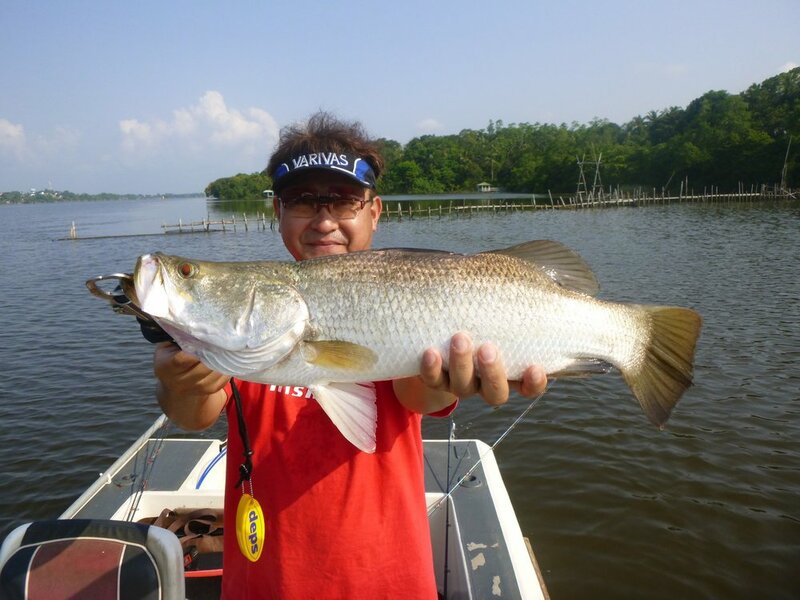 Satoru san fished with us last January and caught some nice Mangrove Jack, but he was unlucky with the Barramundi. But on the first day of this trip, he caught the first barramundi ! Good start ! A bit later and after they caught some mangrove jack, Yuzo san had a serious barramundi bite. The fish goes in long and powerful run, a bit scared Yuzo put some pressure on the spool with his thumb and lost the fish. His lure came back with a hook less and a strong split ring completely open... A serious fish for sure. In the afternoon, he miss 2 nice golden barramundi, fortunately for him, he caught a juvenile GT and a featherback in the evening. Second day, on the morning session Yuzo caught another Featherback and Saturo a baby barramundi, plus some usual mangrove jack. Just before lunch Satoru caught a nice barramundi. On the afternoon session, finally Yuzo san caught a wild golden barramundi. We try also for featherback, but they don't seems very active, then on the last hour before back to the Villa we fished some good spots for barramundi and Satoru san hooked a big wild golden barramundi. Fish was strong, he came twice a long the boat and we saw a very big fish. After a bit of stress during the battle, I finally put the fish in the landing net and it's an absolute beast which is on the boat deck. This wild Golden Barramundi was stubby, his lenght was 89 cm for a weight of 22 lb on the Boga Grip. Satoru san was so happy and I saw his hands were shaking as the one of a kid who caught his first fish. Such a long time I haven't seen this kind of emotion from an angler and I was also so happy for him. Last day the morning session was a bit tough due to some windy condition, but we manage to catch some mangrove jack, tarpon and lady fish. The afternoon, on the first spot Yuzo san caught a nice wild golden barramundi. After that some serious lightning were coming fast, then we decide to end the fishing day and the trip. It was a really nice trip, the guys enjoyed a lot to fish Bolgoda Lake and promised me to come back soon with friends. See you soon then. Japanese Gold Digger at Bolgoda Lake !! 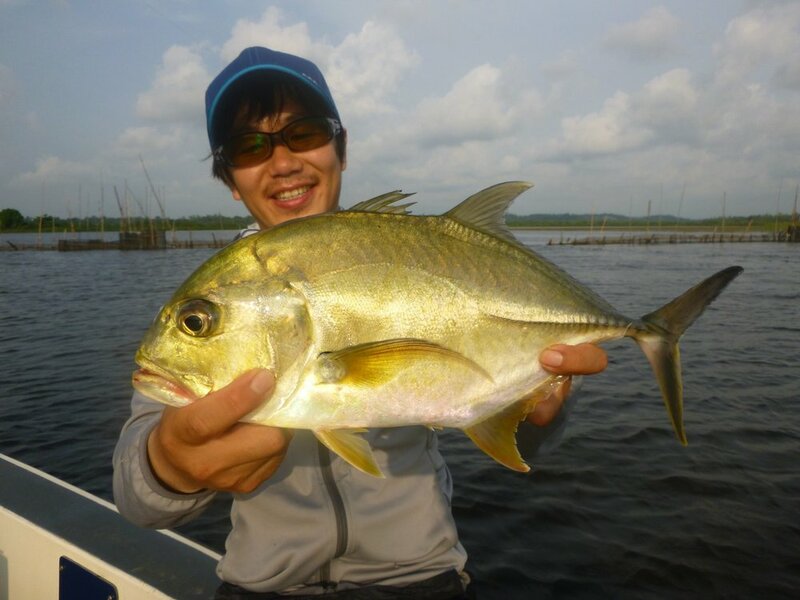 Our regular Japanese expat anglers Sugimoto & Hashimoto came for a week-end to fish at Bolgoda Lake. Weather was good and the Wild Golden Barramundi active. They caught some usual mangrove jack, Sugimoto lost a very big ladyfish and Hashimoto was the lucky angler who caught all the barramundi. Another great fishing week-end at Bolgoda Lake !!! 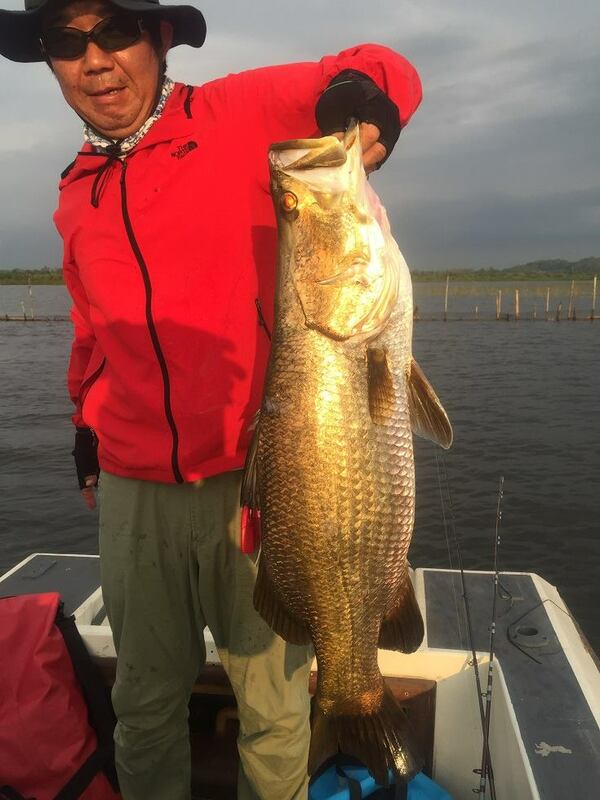 Big barramundi for Japanese angler at Bolgoda Lake !!! Very busy these last days guiding at Bolgoda Lake and no time to put our last fishing reports. But here, a picture of the fish of the day, a proper "fat boy" Golden Barramundi (89 cm for 22 lb) !!! Stay tuned, fishing report coming soon !! Middle April we have received the Jerry's for their second fishing trip in Lanka. 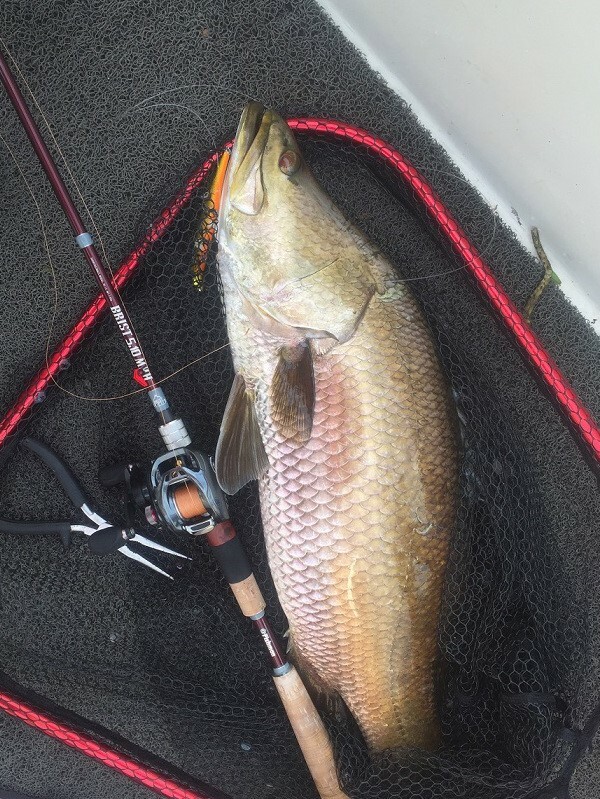 This time, they wanted to focus catching GT's on topwater, plus doing a bit of jigging and finish their trip by some days fishing at Bolgoda Lake for Barramundi. The guys were much better equipped compare to their last trip. This time, they came with proper rods and reels, and good lures for targeting Gt's. We started the trip with some really good action and they caught some nice Gt's. Everybody caught his PB fish and "small Jerry" caught a cracking GT. Big Jerry also have a good GT in the 25 kg range on a PE 4 rod and a stickbait. Chugger popper made the trip as Cubera 150 or the usual Hammer Head E-cup. The last day a bit tired they let me join then and I caught a big GT. Jigging was a bit slow during this trip in term of number of fish but the guys hooked some serious fish, like the unstoppable one who striped all the line, or the other one who fight for 45 minutes before big Jerry broke his rod and then the line. Small Jerry caught also a nice Shark and some groupers. One day on the drop off we saw some big yellowfin tuna jumping and eating tiny red fish, we have a try but the tunas were focus on these small bait. A afternoon we go to found them, but without success despite some big school of spinner dolphin and pilot whales in the area. They also did a bit of light jigging and ave lot of fun catching so different species and small Jerry caught a baby Napoleon Wrass just out of Colombo city on one our good spots. All in all, it was a really good trip, the guys learned a lot during that trip, they enjoyed my sarcastic jokes and we have so much fun. The last day we have a go at Bolgoda Lake and they caught some Barramundi and Mangrove Jack. 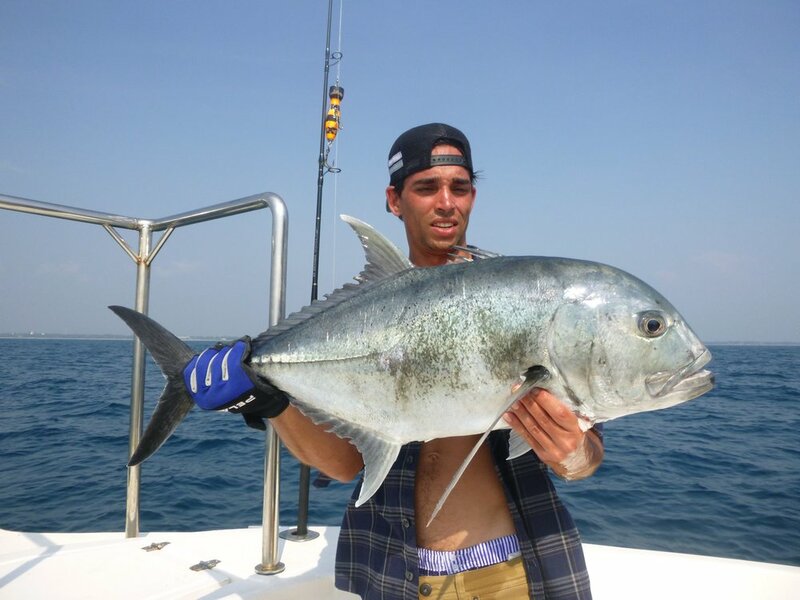 Guys thanks to come fishing with us and I know we will see you soon for another memorable fishing trip in Lanka ! Second Big GT on popping !!! A bit tired the clients invited me to cast with them at the end of the day... First cast and Boom !!! Cracking Big GT on popping for Jerry !!! GT Popping with Singaporean Team !!! We have received a nice Singaporean team anglers with Henry, his brother Louis and his friend Dereck for a great 5 days popping and jigging fishing trip. The others days we mixed the day between popping and jigging. On jig the second day Derek hooked a big sailfish, but sadly it came off after a while and Henry caught a shark. We did also a bit of trolling, especially the last day, condition were perfect with a lot of life, with many birds under skipjack feeding, we also spotted some dolphin and some big tuna, but fish did not seem to play with us. This trip was really nice, we had a lot of fun onboard, especially with Henry when he missed these Gt's the first days, but finally he landed plenty of Gt's and as his brother, he took his personal best GT during this trip !! Derek was a bit unlucky the first days of the trip, but after I gave him some good tips to handle his floating stickbait, he made up for lost time and he landed some good size fish. "Dad & son" GT fishing !!! Just back on the sea for a "Dad & son" day charter. 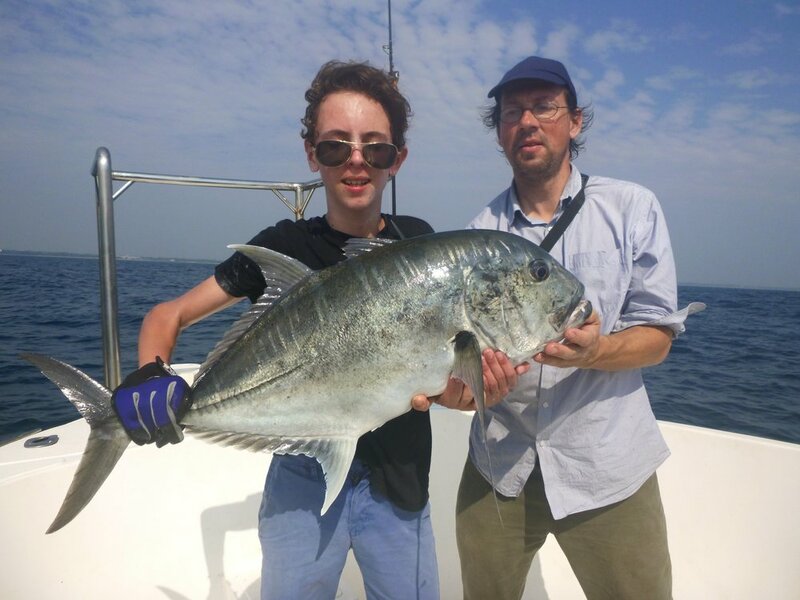 Guilain and his 13 years old son Adrien wanted to finish their holidays in Sri Lanka with a bit of fishing. Guilain who is a expert fisherman in France for sea bass, has fished for GT before. He wanted to share this great experience with his son and asked me to make his dream true. It's always nice to have beginners on board, especially when it's a young boy who love fishing. Morning we reach our first popping spot, I took time to teach Adrien how to cast with this heavy tackle and how to pop. I know it will take a while, but after his first cast, I was confident it can do it. His father Guilain was quickly in the game and on the third drift, I spotted a school of bait and he cast at the edge of them. A GT come up and smashed his popper. Guilain strike properly the fish and landed a decent GT, that's a good start ! A while later another GT came behind his popper but miss the lure. Around noon, the current slow down and I decided to go for trolling. That will give a bit of rest to Adrien who started to be tired casting with heavy tackle. We reach an area where I know we have good chance to have wahoo and sailfish bite. When we reach this area, we saw plenty of birds and skipjack busting small anchovy. We trolled and we were waiting to have a bite. Sadly, we don't have any action despite a good activity with skipjack feeding around. Then we go again for some popping to end the day. Adrien was really motivated to caught his first ever GT on popper. He kept casting, and like usual his effort pay off and a GT took his popper. His father came to help him, but Adrien handled it well and landed his dream fish. Guilain was so happy and proud of his son. After a quick picture, Adrien released his fish. After this GT, Adrien's cast were just perfect and we can feel his motivation to caught another one and on the next drift he caught his second fish !!! Guilain was not expecting so much for his son and it's with lot of happiness we decided to end the day and back to the harbour. Another good day fishing at Bolgoda Lake for Hiro & Miyazaki san !!! A week ago Hiro san and Miyazaki san were back for a day fishing at Bolgoda Lake with our fishing guide Shaktivel and as usual they have a great fishing. The rain of days before make water color a bit murky in some area of the lake and don't make the fishing easy for them, but Shaktivel with his good experience of the lake found some good spots with clear water. Morning only Miyazaki san caught fish with 3 nice mangrove jack, one was 49 cm and give him a good fight. Hiro san just lost 2 lady fish. 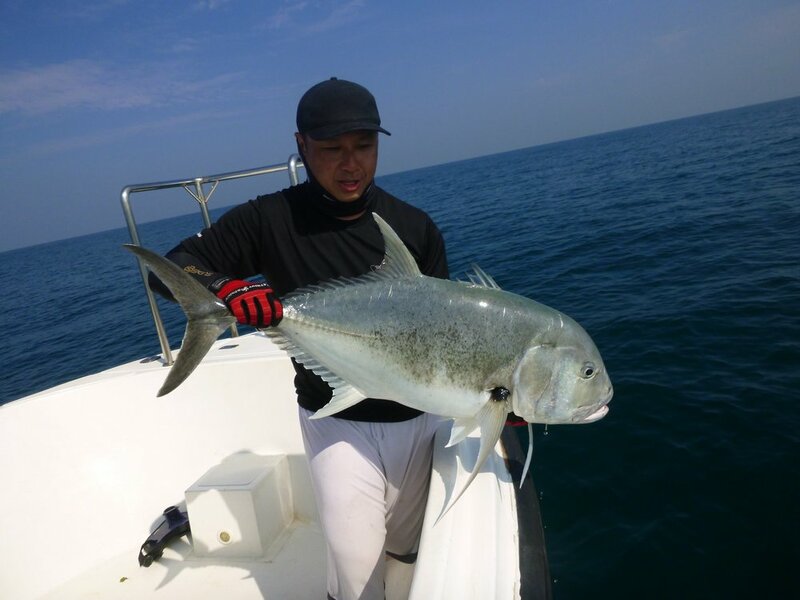 Afternoon, Shaktivel try another area and Hiro san break the ice catching a 50 cm Golden Barramundi. After that catch, they want to have a try on the featherback, which were active due to the rain of the last days. The elusive knife fish were rolling every where, but not of them were keen to bite. At sunset time, Shaktivel decided to have a try on one of our good barramundi spots and Hiro san, who has caught his personal best Golden Barramundi on his last day fishing a month ago, caught another big one of 83 cm !!! Like he told me : "This fish was few centimeter more than the one I caught last time, but completely different fight and weight !! It was Big Mama !! The Bomber Long -A hooks were bended and snap also was almost broken." Congratulation Hiro san for this very nice catch and hope to see you soon for another good day fishing at Bolgoda Lake !! Nice GT fishing on popper !!! Last week, before our Head Fishing Guide Nico goes to Japan for the Keep Cast, we received Sam and his girlfriend from Australia and 2 french anglers, Nicolas and Olrich for a day charter at sea, mainly to target GT on popper. Sam and Nicolas have fished GT on popping before, for Olrich, it was his first fishing experience. Early morning we reach our popping spot with a flat sea condition. We found plenty of bait and after a while Sam with his popper Cubera 150 cast close a school of fusiliers and on the third pop a decent GT come up and grab his lure in a nice splash. He hooked properly his fish and after a nice fight he landed the GT, he was so happy. This action keep all casting and Nicolas caught a small GT and another one, Sam missed a very nice GT close to the boat and at the same time 2 big king mackerel came behind his popper but sadly don't bit it. On our last drift of the day, a massive whale shark came on surface and passed under the boat and let us in memory the nature is just beautiful. Another good day fishing in Sri Lanka with happy clients !! !